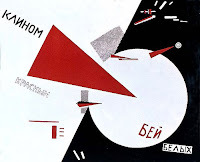 There are three main movements, belonging all of them to the same period of time: Constructivism, Suprematism and Rayonism. The three of them had connection with other movements of the time as Cubism, Neo-Plasticism and Bauhaus. Other of their common characteristics is the depiction of abstract form or figurative but with a great influence of Cubism. Constructivism was first created in 1913 when the sculptor Tatlin discovered the works of Braque and Picasso in Paris. Back in Russia he began producing assemblages but abandoning any precise subject of themes. The Constructivist art refers to the optimistic, non-representational relief construction, sculpture, kinetics and painting. The artists did not believe in abstract ideas, rather they tried to link art with concrete and tangible ideas. Their depicted art was mostly three dimensional, and they also portrayed art that could be connected to their proletarian believes. Artists belonging to this movement are: Rodchenko, Tatlin, Gabo, Pevsner, El Lissitzky, Malevich. Suprematism is considered the first systematic school of purely abstract pictorial composition in the modern movement, based on geometric figures and was the expression of the supremacy of pure sensation in creative art. 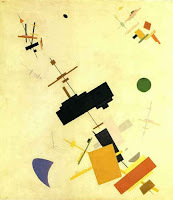 The movement was founded by Malevich in Moscow, parallel to Constructivism. The project was above all the brainchild of the painter and theoretician. According to him, to liberate art from the ballast of the representational world. The work of the painter no longer involved representing and creating chromatic harmonies or formal compositions, but rather attaining the limits of painting. It consisted of geometrical shapes flatly painted on the pure canvas surface. The pictorial space had to be emptied of all symbolic content and all content signifying form. It had to be decongested and cleared so as to show a new reality where thought was of prime importance. Rayonism represents one of the first steps toward the development of abstract art in Russia and was founded by Larionov and Goncharova. 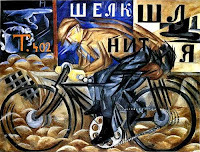 The style was a synthesis of Cubism, Futurism and Orphism and it is also known as Cubo-Futurism. They turned their back on all manner of technical formulation and all kinds of erudite cultural references. They produced works made up of diagonal beams of colour. Blocky Cubist shapes are closely packed in a dynamic Futurist rhythm across a surface also marked by a series of sharp diagonals. Some paintings featured one predominant colour. Next, these compositions were worked out in an autonomous way: only the rhythms and harmonies then guided the painter in his attept to make the dynamic radiation of the colours perceptible.